Joe Robaina is the Founder and Developer of the American Cane Self Defense (ACSD) system and a pioneer of the Cane arts and culture. Reality based scenarios and drills with an evaluation scale for professional instructors. He is the first to document these in great detail on video and print. Robaina is also known as the main proponent of the “heavy” thumper type American Cane to go with his Powershot Template. He is the developer of the premiere air craft grade aluminum Robaina Raven Self Defense Cane. Freestyle: Robaina introduced many freestyle maneuverability skill sets including shoulder, neck, and waist loops and catches, and is well known for his two Cane skill sets. In particular, he is the first to document simultaneous ambidextrous multi-skill sets with full length double canes and mini freestyle canes. He is the developer of the unique drills and methods for this type of Cane free-styling. He is the author of many if not most of the American Cane lingo and alphabet used today. He used his background as a degreed exercise physiologist and Doctor of Naturopathy to develop the Cane Fit exercise system and Quantum Cane Healing methods unique to the ACSD system. 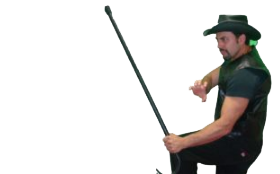 He has introduced the mainstream masses, from corporations such as Royal Carribean and MTV to industries like Real Estate and Massage Therapy to the invaluable use of the Cane as an improvisational self defense tool. His personal students range from government consultants and world class protection specialists to safety minded civilians. Today via his live training’s and online Cane Self Defense University, the Cane is rapidly being recognized as the most practical and effective self defense tool while turning injuries to victories for those using the Cane as a medical aid.